It has been an amazing season, where we witnessed the donation handover to the first Rural schools selected by the Cash Challenge winners. The Headmasters couldn’t believe that their schools had won through selection from Club members who had won the Cash Challenge. We are happy the monies went to a good cause, and they definitely made a remarkable difference to the schools and- most importantly- to the livelihood of the pupils. Mariya Primary School from Chipinge had the largest donation of $5,000, which they used to buy much- needed furniture for their ECD class. Gundura Secondary School from Mashava used their donation of $3,000 to purchase a fence, which they erected right round the school, as well as a laptop for the headmaster. Kanyemba Secondary School in Mazowe purchased a school fence. 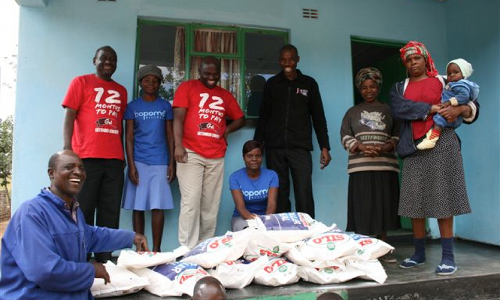 Apart from the Cash Challenge donations, we have also been busy with various CSR activities, donating foodstuff to Bopoma – an orphanage in the Masvingo region. We were also touched by the plight of the woman from Chiredzi who gave birth to quadruplets, and donated 2 beautiful hampers for her new babies. We are fulfilling our promise to continue to give back to the communities around us, and it is fulfilling to us when we witness the smiles and tears of appreciation for the efforts we put together.